Starlight Cinemas starts June 12th and ends on August 21st with the 5th annual Zombie-O-Rama. The Downtown Farmer's Market is open every Friday from 10am to 2pm through November 15th on San Pedro Street. The 33rd annual Fountain Blues Festival kicks off on July 20th at St. James Park. San Jose Jazz Summer Fest is scheduled from Aug. 9-11th. The Farmers Union gastro-pub and sports lounge is taking a huge corner space at 151 W. Santa Clara St. and will feature a wood-fired oven, 20 HD TVs, and over 50 beers on tap. Blackbird Tavern will be coming to 200 S. First St. with a diverse menu of fresh pub food and French bistro favorites. Live music will also be a key attraction here. Orchestria Palm Court is opening their doors at 27 E. William next to the San Jose Stage and will have some very unique music machines to entertain diners. Chef Mo's Cafe is open at 261 N. Second St. in the Germania Hall and is serving artisan Braunschwiger, German salami and chicken sandwiches, spinach and berry salad with mango chutney, and several other options. 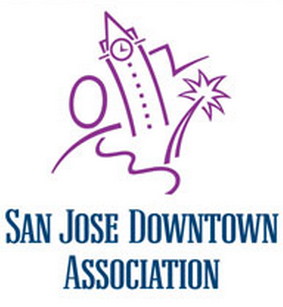 Downtown San Jose is getting enhanced security patrols courtesy of the PBID district program (Groundwerx). Two officers are scheduled for 32 hours each week to deter "quality of life" crimes such as trespassing, vandalism, and drinking in public. Josh, Suggestion for the blog: How about adding links to san jose venues on the sidebar? To events at the shark tank, san jose civic, the rep etc.